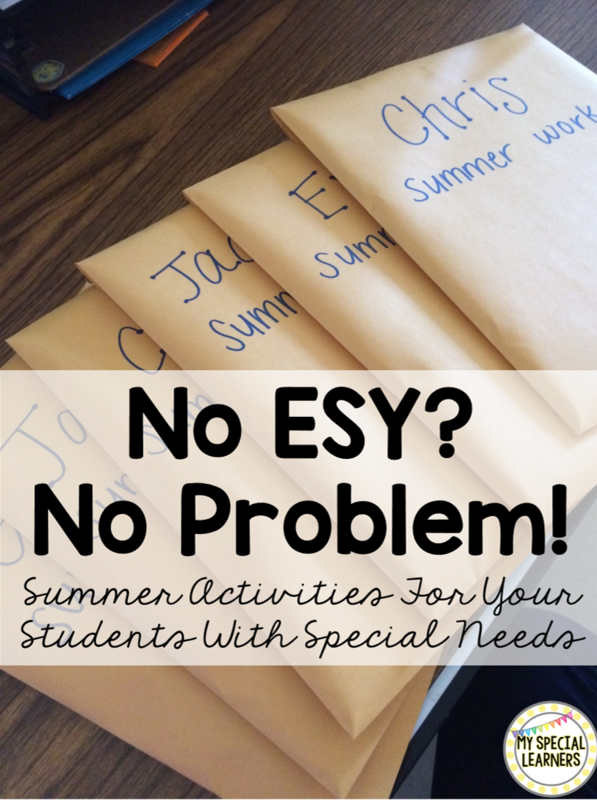 Do your students participate in ESY? For many students with special needs, summer can be tough! They spend 2 1/2 months out of their routine and doing NO work. Some schools run Extended School Year programs, others do not. The majority of my students do not participate in any ESY, but that doesn't stop me from keeping their brains working! At the end of each school year, I like to put together a "Summer Homework Packet" for my kiddos to have on hand over the summer. This isn't work I want back, nor do I push parents to do everything in it (although I hope they do!!). Each year our packets look different, but I wanted to share some of the goodies I put in this year's packet for my munchkins! All of the things included are work they're familiar with and do on a daily or weekly basis with me in the classroom. The Unique Learning FREE summer program! If you haven't heard about this yet, it's your lucky day! We use Unique all year long, so my students are familiar with it. If you want to check it out for next school year, head on over to their website and download the free summer curriculum. I sent home books with comprehension, math pages, and even a fun Olympic pretzel rings recipe for parents to cook with their kids! I also sent home extra writing pages from Melissa from Autism Adventures TpT shop! Any pages we didn't get to over the school year got sent home. My students always loved doing these in the morning, so I know they will love showing their parents what they can do this summer!! I also sent home some of these themed worksheets from Superheroes in SPED ESY unit! I know my kids will love doing firework and beach themed work over summer break! I also included some fun Basic Skills Summer Activities from Teaching Special Thinkers and PCI Reading Level One flashcards for students that are working on PCI to learn how to read! Do you send home summer work for your students? What kinds of work do you send? I do something similar for my students. I also included a self addressed stamped envelope to encourage writing.